Santiago de Chile, or only briefly Santiago is the capital of the South American country of Chile. The city of Santiago is located in the central part of the country and is the only region of Chile, which has no outlet to the Pacific Ocean. Founded on February 12, 1541, today Santiago is the main economic and cultural center of Chile. The whole city is located in the mountainous region of the Andes and extends over an area of 641 square kilometers. It deals in modern industry primarily, but also the cultural city of Santiago has about 5.5 million people, including the suburbs. Founder of Santiago is Pedro de Valdivia, after February 12, 1541 under the name of Santiago De Nueva Extremadura. Modern Santiago is mainly an industrial center, but is not lacking artistic spirit, reproduced in numerous galleries, exhibition centers, art museums, theaters, etc. In Santiago, along with modern shopping streets and buildings, you can see exhibitions of local craftwork and unique street performances by original artists and musicians. As a modern, thriving city, Santiago offers all the amenities and entertainment. There are numerous restaurants, discos, clubs, museums and universities, as well as international and national airports. Modern metropolitan transit provides fast movement from point to point while you can often encounter a temporary exhibition in various subway stations. Geographically speaking, Santiago is located in the center of the eponymous pool, which actually represents huge and wide valleys among the Andes mountain range. The wide and fertile plain is surrounded by mountains. On one hand, Santiago is surrounded by the Chilean coastal zone (west) and you can look east to see the picturesque hills of the Andes. Culmination in the mountain range around Santiago is Tupungato volcano, which reaches 6570 m altitude. Other volcanoes in the region are San José and Maipo. Cerro El Plomo Peak is the highest point that can be seen from the urban area of the capital of Chile. 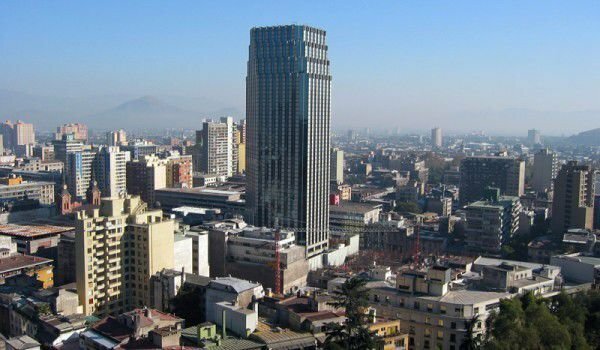 Santiago is one of the fastest growing economies in South America. The capital of Chile is one of the most modern urban areas in this part of the continent, with fast development in suburban networks, dozens of shopping malls and impressive modern architecture. Santiago is the regional location of many multinational companies and financial center of Chile. Among the cultural attractions of Santiago is the Museo de Bellas Artes. On the street, right there you can see an interesting form of street performance. Quite often, especially on weekends, actors make up random vehicle stops, the driver takes the keys, and has frivolous conversation with him. In parallel, the actors open the trunk and began to improvise various scenes with objects they find in it. This form of performance enjoys a special interest among residents and visitors to Santiago, as these performances are usually accompanied by crowds of people. Despite the relatively long history Santiago has not kept many historic buildings from the Spanish colonial era, mostly because of large earthquakes, which the capital of Chile experienced. Among the architectural and historical landmarks of this period today fall Casa Colorada, dating from 1769, the church of San Francisco, built in 1586 and the building of the remarkable Posada del Corregidor (1750).